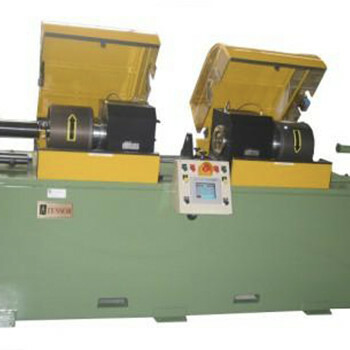 Binder - Dual Single Head | Tensor Machinery Ltd. This Dual Single Binder is designed to bind copper conductors or other subunits before they enter a jacketing line. Two single head binders are mounted on a common frame. The binder heads run independent of each other. This allows one binder to bind the subunits together while the other binder is being loaded with binding material. Each binder head is capable of obtaining speeds of 4000 rpm with the Tensor recommended binder packages. The binder heads are mounted on rigid platform, with each head driven by its own AC Vector motor. The subunits first enter the tape former and wire guide mounted at the entrance to the binder unit. After the tape is applied, all the conductors enter the core tube. This tube holds the conductors together until the binder material is applied between the two binder heads. There are two binding points, one binding point for head #1 and one binding point for head #2. Both of these binding points are located between the two heads. Interchangeable binder dies are used to hold the subunits close together while the binder material is applied. Different dies can be used to accommodate for different conductor sizes. The binder tension is achieved using an electromagnetic brake coupled to the cop holder. The binder tension is constant throughout the run since PLC takes into account the binder cop diameter, binder head speed and the line speed. A local operator touchpanel and PLC control the binder functions. The binder unit can also be placed on tracks to move the unit on or off the line.